London, UK—If you can’t beat ‘em, join ‘em. And for good measure, box 'em into a corner too. Because when you’re the 800-lb gorilla, joining ‘em is going to dramatically change the rules for everybody and it might even end up taking some of the competition out of the game. 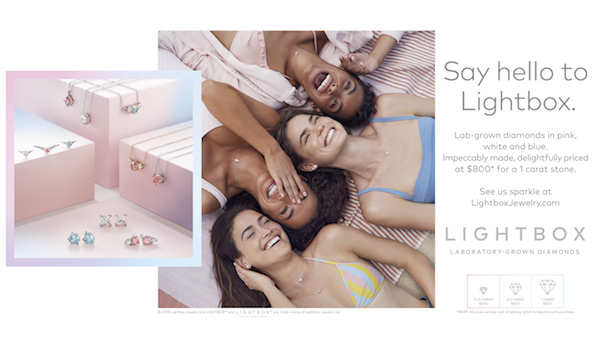 De Beers Group's new lab-grown diamond company, Lightbox Jewelry, will begin selling synthetic diamond jewelry online directly to consumers in September. The new brand's strategy is to offer high-quality fashion jewelry designs at lower prices than existing lab-grown diamond offerings. Lightbox lab-grown diamonds will retail from US $200 for a quarter-carat stone to US $800 for a one-carat stone. That’s a lot less than Brilliant Earth is asking for its one-carat stones ($2,050), or Barneys New York’s designer pieces done in collaboration with Diamond Foundry. The Lightbox line will source its diamonds from De Beers Group’s Element Six lab-grown business. As another point of differentiation from existing synthetic lines, it also will include pink and blue lab-grown diamonds in addition to white. What it won’t include, however, are bridal pieces. “Lightbox will transform the lab-grown diamond sector by offering consumers a lab-grown product they have told us they want but aren’t getting: affordable fashion jewelry that may not be forever, but is perfect for right now,” said Bruce Cleaver, CEO, De Beers Group. “Our extensive research tells us this is how consumers regard lab-grown diamonds: as a fun, pretty product that shouldn’t cost that much. So we see an opportunity here that’s been missed by lab-grown diamond producers. Missed opportunity? Or purposeful defense? This is where the 800-lb. gorilla flexes its muscle. By positioning Lightbox as fun, pretty, and (relatively) inexpensive, De Beers with one gesture neatly sweeps all lab-grown diamonds into the same bucket: if not exactly costume jewelry, not rare or valuable, either. And let's not forget its considerable marketing muscle: this is, after all, the same company that singlehandedly kept up generic diamond category advertising for decades. The Centurion obtained a copy of a letter written from Feriel Zerouki, De Beers Group senior vice president of International Relations and Ethical Initiatives, to Ronnie Vanderlinden, president of DMIA. It reads in part, “…Lightbox will help clarify consumer confusion about LGDs with regards to what they are, how they are produced and how they differ from diamonds, by being transparent about their production process and value proposition. In other words, protecting its turf. Other lab-grown diamond companies all do only one thing: grow diamonds. They have to be profitable to survive, while De Beers can afford to treat Lightbox as a loss leader. As the industry converges on Las Vegas, I’d bet De Beers could care less if Lightbox ever makes a dime. Its job, I suspect, is not to add profit but rather to ensure the floor doesn’t drop out of the natural diamond market. 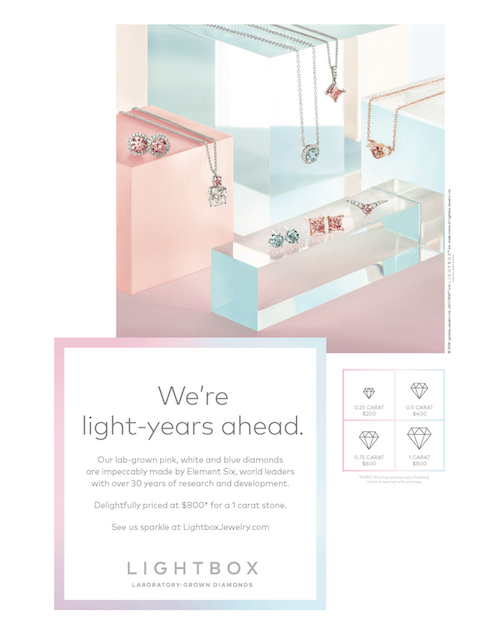 If Lightbox makes money, that's some nice extra gravy, but by positioning Lightbox as fun and frivolous--not forever--De Beers really is shoring up the value proposition of natural diamonds. But De Beers actually has been doing this lab-grown thing for a long, long time. Its industrial division, based in Maidenhead, UK, rebranded as Element Six in 2000, but it's been around since 1946. Although Lightbox is its first foray into jewelry, it’s had a lot of practice growing diamonds--which it started doing in the 1950s--and a lot of time to figure out greater efficiencies in doing so. Except for General Electric, which also started making synthetic diamonds in 1954, all the other manmade diamond companies are still in relative youth, if not infancy. Having De Beers enter the lab-grown market is like Placido Domingo being a contestant on The Voice. “Lab-grown diamonds are a product of technology, and as we’ve seen with synthetic sapphires, rubies and emeralds, as the technology advances, products become more affordable. After decades of R&D investment, we’re able to offer consumers a better price today. While it will be a small business compared with our core diamond business, we think the Lightbox brand will resonate with consumers and provide a new, complementary commercial opportunity for De Beers Group,” said Bruce Cleaver. “Lightbox also brings a commitment to transparency to the lab-grown diamond sector,” added Steve Coe, general manager. “We’ve learned from our research that there is a lot of confusion about lab-grown diamonds; what they are, how they differ from diamonds, and how they are valued.” Lightbox will be clear with consumers about what lab-grown diamonds are and will offer straightforward pricing that is consistent with the true cost of production, he said, and offer consumers sparkle and colors at a very accessible price. Meanwhile, the Diamond Producers Association, whose objective is to promote long-term demand for diamonds as unique miracles of nature, in acknowledging that one of its major contributors—and the employer of its chairman—is entering the manmade market, has taken the view that if someone is going to do it, better one of their own, especially one whose dominant market leadership will help ensure lab-grown stones are permanently positioned as the opposite of natural diamonds. Lightbox will launch in the United States and will initially be available to U.S. consumers through the Lightbox e-commerce website, with retail partnerships to be announced in due course, said a statement from the company. To support Lightbox, De Beers Group is investing a total of US$94 million over four years in a new Element Six production facility near Portland, Oregon, adding to Element Six’s existing UK-based facilities. Once fully operational, the plant will be capable of producing upwards of 500,000 rough carats of lab-grown diamonds a year. Any Lightbox lab-grown diamonds of 0.2 carats or above will carry a permanent Lightbox logo inside the stone. Invisible to the naked eye but easily identified under magnification, the logo will clearly identify the stone as lab-grown, and also serve as a mark of quality and assurance that it was produced by Element Six. Homepage from the Lightbox e-commerce website; the site will be live in September.